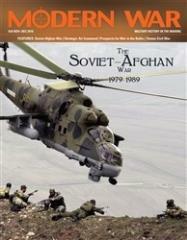 Invasion Afghanistan: The Soviet-Afghan War is a solitaire game that simulates the Soviet invasion of and the war in Afghanistan, 1979-89. The player controls Soviet forces, but the Opposition Force (the Resistance) is controlled by the game system. The war is played as scenarios in which you, the player, must accomplish various Missions to win. 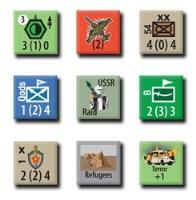 The game shows the war from the perspective of the Soviet command; It concentrates on its major historical objectives…victory is in terms of holding the cities, towns, and lines of communications. You can also win by destroying Resistance morale.